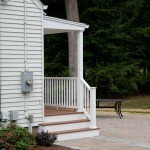 Bailey Carpentry is a deck and porch builder in the Glastonbury CT area. 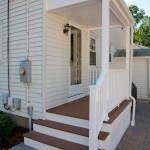 We also repair decks and porches. This is a job that we did in Glastonbury that entailed removing and replacing a back porch. The entry door and the storm door were also replaced. Once everything was torn down we cleaned the area up and removed the debris from the site.The floor of the new porch was designed and built like a deck. Covered porches were often designed with tongue and groove floor boards that had to be installed with a slope great enough to allow water to run off. 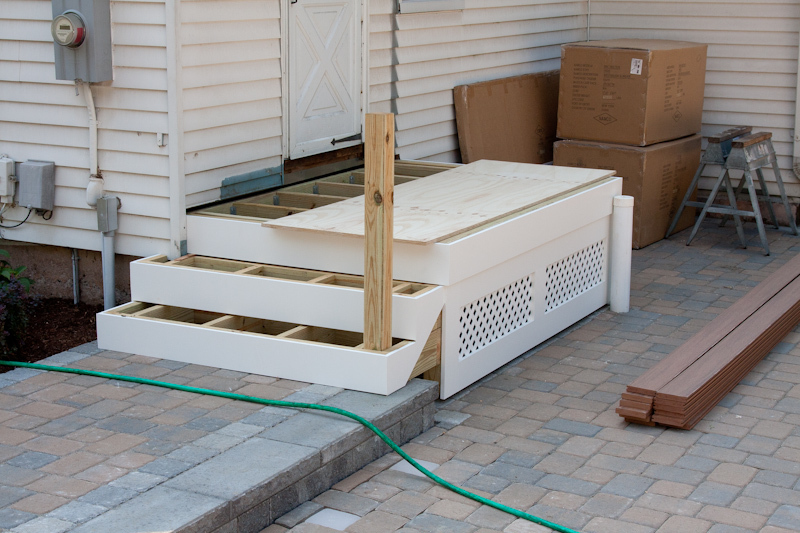 Deck floors are built level, and regular decking boards are used and spaced enough so water passes through. We put in new footings to support the porch, and then the landscapers installed a concrete paver patio. Pressure treated lumber was used to frame the deck portion of the porch and the support for the stairs. Ultimately, all the pressure treated lumber would be covered with Azek trim. The customer wanted to use low maintenance materials as much as possible, and we chose Azek because of its availability with our local lumber yard. 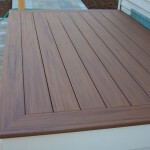 Using composite deck materials provides an attractive and low maintenance approach to a deck or porch renovation. Lattice panels were made to surround the underside of the deck. A 4×4 pressure treatedpost for the stair railing was bolted to the framing before wrapping the stringers with Azek trim. The 4×4 was eventually covered with a composite post sleeve. When the trim boards were applied, all of the outside corners were mitered and glued with PVC cement. 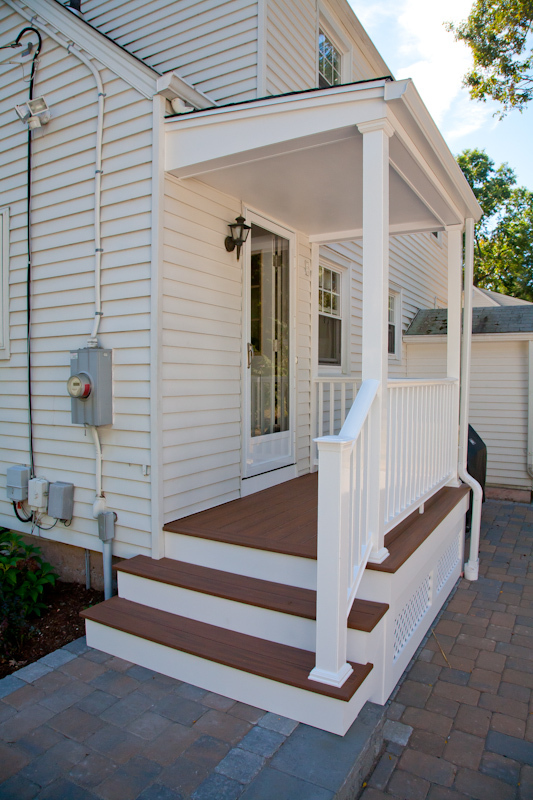 Timbertech composite decking was used for the porch floor and the stair treads. 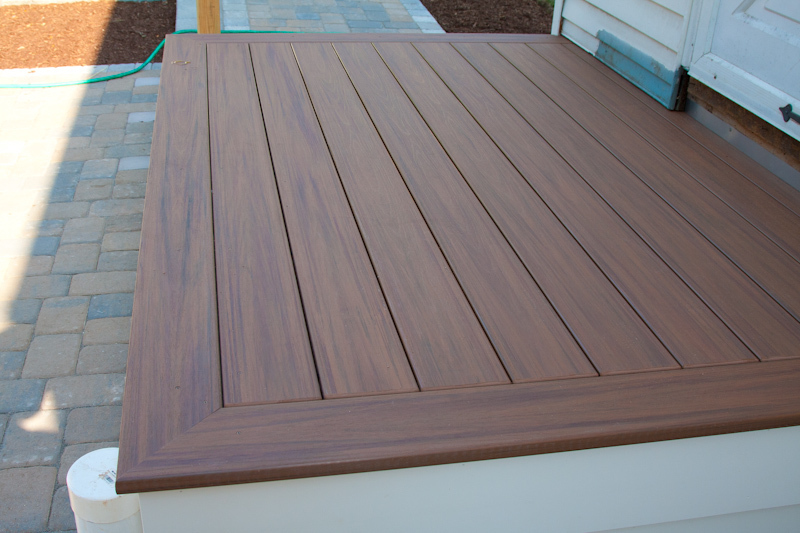 The composite deck boards, like the Azek trim, are a PVC product. We mitered the ends of the stair treads and fastened a nosing piece to hide the PVC core of the deck boards. On the porch floor a deck board was installed around the perimeter, then mitered and glued at the corners to hide the inner core of the PVC. The ends of the decks boards were rounded over with a router bit to provide a nicer look. Once the floor was completed we framed the new porch roof and ceiling. The posts that supported the roof were screwed in place temporarily so that the composite post sleeves could be installed later. We used Azek boards for the roof trim and fascia. The railing system is composite, and also made by Azek. The white finish on the rail provided a nice contrast with the darker composite decking. 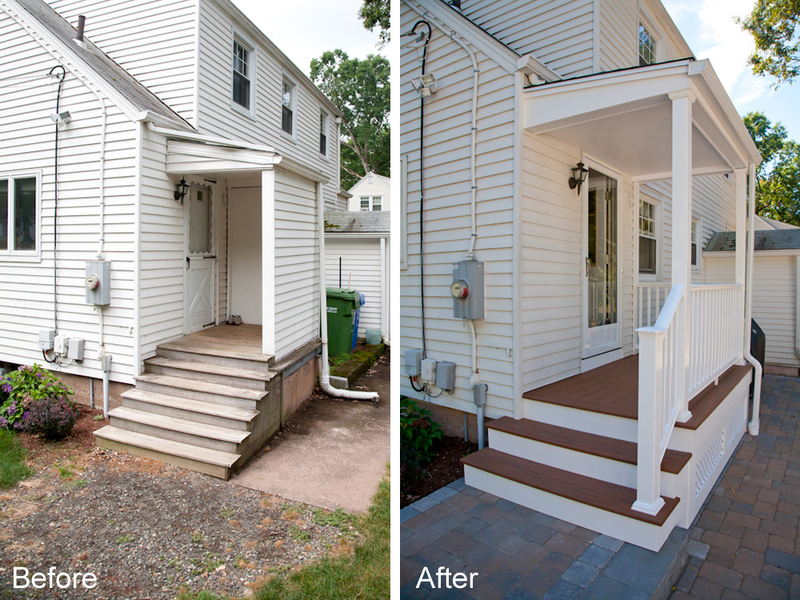 The “before and after” image above shows the completed porch, with the new entry door and storm door installed. 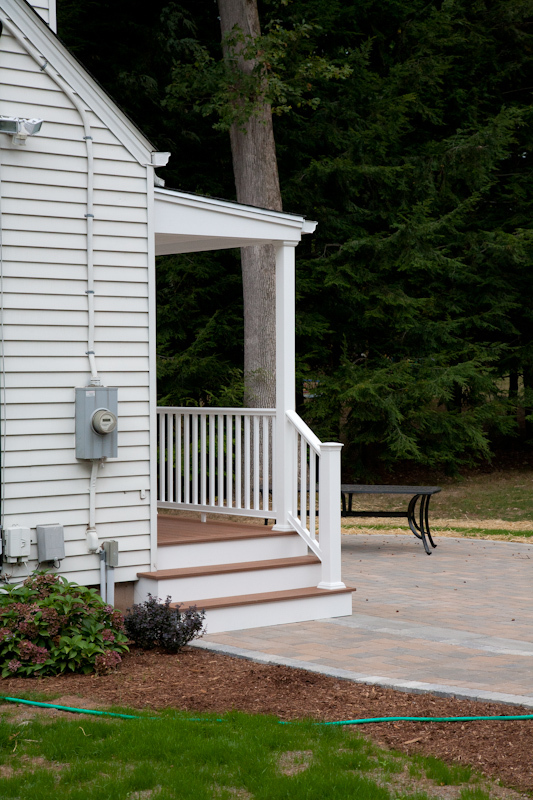 Bailey Carpentry offers a full array of home improvement services to customers in Glastonbury and throughout the Central Connecticut area. Please feel free to contact us with any comments you may have, or questions about an upcoming home improvement project or idea. We look forward to hearing from you. 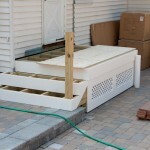 This entry was posted in Porches and Decks on December 27, 2012 by admindave.